Start slowly and test your steering control and braking ability. Avoid spinning your tires when you start by gently pressing your gas pedal until the car starts to roll. Begin slowing down at least three times earlier than you normally would when turning or stopping. Snow tires can provide extra grip for winter road conditions but remember that even snow tires will slide on ice or packed snow so keep your distance. Reduce your speed to correspond with conditions. There is no such thing as a “safe” speed range at which you may drive on snow or ice. Be cautious until you are sure how much traction you can expect from your tires. When stopping, avoid sudden movements of the steering wheel and pump the brake gently. 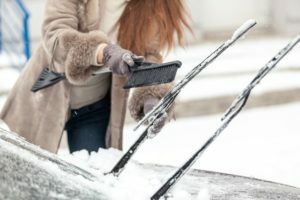 Avoid locking of brakes on glazed ice as it will cause a loss of steering and control (Check your vehicle owner’s manual, if the vehicle has anti-lock brakes, you may apply steady pressure to the brake pedal). Road conditions can differ greatly in a short span of distance, depending upon sun or shade and the surface of the roadway. Maintain a safe interval between you and the car ahead of you according to the conditions of the pavement. Many needless rear-end crashes occur on icy streets because drivers forget to leave adequate stopping space. Keep your vehicle in the best possible driving condition. The lights, tires, brakes, windshield wipers, defroster, and radiator are especially important for winter driving. Keep your windows clear. Don’t start driving until the windows are defrosted and clean – even if you’re only going a short distance. Watch for danger or slippery spots ahead. Ice may remain on bridges even though the rest of the road is clear. Snow and ice also stick longer in shaded areas.